What can people expect for the Jazztet’s performance on the 6th? Aaron Scott (AS): We’ll show a cross section of Mark’s writing. From intimate and lyrical, to whimsical, to hard swinging be-bop influenced tunes. What are your favorite memories from playing with Mark? AS: Playing regularly with Mark on Fridays at Hyde Park never grew old. Those were always great gigs. Also all of the museum concerts we did throughout his series there. The last concert he played at the museum, an all Mancini show, was one of the best. We had a packed house and Mark was really struggling by then. But he persevered and the playing was great from him, as well as the entire band. What do you think is the most notable aspect of Mark’s compositions? AS: Mark wrote very complex tunes. From the way he wrote chord structures, to little counter melodies interwoven in a tune, to clever chord movement within a tune. There is a great deal going on in all of Mark’s compositions. How do you think playing with Mark shaped your approach to the drums? AS: Mark viewed the drums as a lyric part of the ensemble, Not just a rhythm instrument. An equal part of the group. He was strongly influenced by Bill Evans and Keith Jarrett. The interaction in those trios definitely impacted the way Mark and I played together. And forever made me a better musician. You and Mark are both widely acknowledged as great teachers. Could you talk a little about your thoughts on pedagogy, especially as it concerns jazz, and how that landscape is changing? AS: I teach music first, jazz second. The industry is quite different now. Rhythm section players are expected to be able to cover a wide variety of styles as a hired gun. I think it’s important to prepare students to be viable working musicians in an ever-changing landscape. Playing jazz is a privilege. And it requires a great deal of listening. Records from the past and recent, as well as other local players. Also playing with as many different players as possible will always make you a stronger musician. What do you have planned for future installments of the Jazz at the MAC series? AS: Next season at the MAC we hope to include a Holiday show early in December featuring vocalist Shaun Booker. Also on deck is a tribute to my father, Bob Allen, featuring Dave Powers on piano. Also look for a performance to include Tony Monaco as we honor the great B3 organ players of the past. 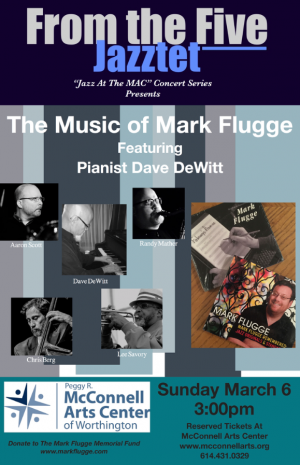 Visit markflugge.com to stay up-to-date on tributes to and recordings of Flugge, as well as to donate to the Mark Flugge Memorial Fund.